Fig. 4. Root phenotype of seedlings derived from Lesarboh-RNAi-knock-down lines. (A) Root of WT seedling. (B) Root of lesarbohBRNAiB1 seedling 5 d after completion of germination: representative of phenotype stage 1. The lower part of the root is defective in tissue organization and turned into a thin thread-like structure with a thickened root tip. (C–E) Roots of lesarbohB-RNAiB1 seedlings, 10 d after completion of germination: representative of phenotype stage 2. The thickened root tips have fallen off, and the roots have developed irregular lateral roots and callus-like tissues. 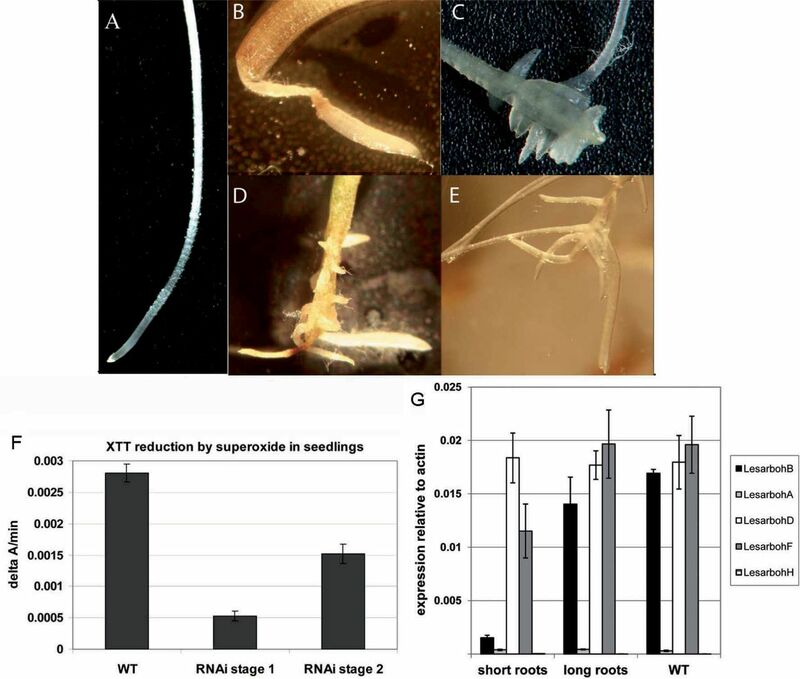 (F) Superoxide production as measured by XTT-reduction in WT seedlings and in the RNAi-seedlings at stages 1 and 2 of the root phenotype as indicated. (G) Expression of Lesarbohs in T2 seedlings that showed the root phenotype ("short roots") versus seedlings that have WT-like roots ('long roots'). Transcript abundance was corrected to the abundance of transcripts associated with the L. sativum standard genes Actin 7 (ACT7, HQ436350.1) and Elongation Factor 1α (EF1α, HS981853.1). Averages of 5 biological replicates ± SE are shown.